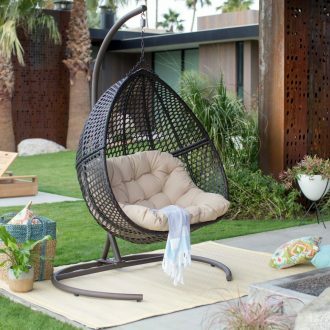 Swing chairs are without a doubt a fun addition to any space. It could be that you want to put it out on your front porch or maybe indoors in a sunroom. Whatever the case, there is something about these seats that take you back to your childhood in a fun but sophisticated manner. Below is a comprehensive review of a very popular XL model on the market today. 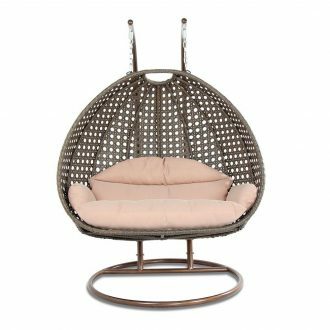 1 THE ISLAND GALE WICKER SWING – WORTH IT OR NOT? THE ISLAND GALE WICKER SWING – WORTH IT OR NOT? The swing comfortably seats two people. A maximum weight capacity of 528 pounds. Strong and stable bronze steel frame. It has a 2 stand design for better weight distribution. The cushion covers can be removed and washed. The cushions are tufted for added aesthetic appeal. In addition to these basic features and specifications, the seat is designed to offer maximum comfort to the user. Below are 2 key features that facilitate this. The seat on this swing features a flat bottom. This is generally considered more comfortable and more stable. However, it might be a slight con if you prefer the curved base design. Its dimensions also facilitate comfort standing at 58.27 inches wide by 48.81 inches tall by 27.5 inches deep. 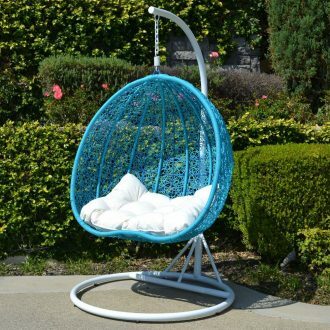 This allows you to sit, lean back or even lie across the swing. It is a great design that compensates for the seat’s lack of a foothold. The seats are lined with foam stuffed cushions that are covered with soft cushion covers. The cushions span the entire base of the seat, part of the back and part of the sides of the swing nook. This allows you as the user to relax taking pretty much any angle or position without having to worry about running out of the comfortable cushion. They are also very generously stuffed which significantly improves the comfort levels. Here you can find the customized patio loveseat cover, which is the best protector for your Island Gale Luxury 2-Person Swing Chair. It is easy to assemble: According to the manufacturers, it should only take you 3 minutes to get the swing set up and ready for action. 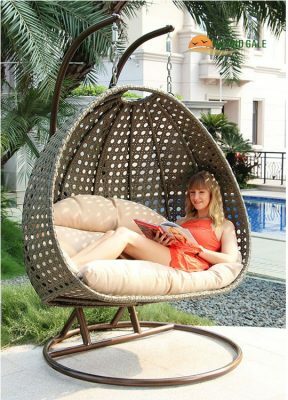 The frame design is responsible for this convenience as all you have to do is to hang the swing wicker onto the frame. It has aesthetic appeal: This is mainly because of the woven wicker design. It gives it a simple yet classy look. All parts are weather resistant: The frames are powdered for rust resistance which allows easy outdoor use. The woven wicker, on the other hand, features weather resistant polyethylene fibers which protect it from everything including rain and UV. It is easy to maintain: The cushions covers can be removed and washed easily. As for the rest of the swing, a simple wipe and dusting on occasional is all you need to keep it looking good. Designed for two people: There is enough place to prop your self up long ways and have plenty of room for both legs. The base of the frame occupies a lot of space: At 47.24 inches by 47.24 inches by 12.99 inches, the frame is pretty average in size. However, the base is significantly larger than what you get with other models of a similar design. There are numerous other models out that you can look into while shopping for a swing chair. Below are 3 of the best in comparison to this Island Gale. This swing is available in various colors and pretty similar in terms of design and appearance as the Island Gale swing. It features a woven wicker design with a single pole frame. The frame itself is made out of Aluminum. The swing offers a 418 pounds maximum weight limit with enough seating space for two. Another interesting feature is the egg shape that results in a concave curve seat design. This steel frame model also features the egg shape resulting in a curved seat base. Compared to the Island Gale swing, it happens to have a significantly smaller frame base which makes results in less space consumption. The frame and the wicker itself feature UV protection reinforcement as well as resistance to chipping. One unique feature is that the seat height is adjustable. It can handle two people with a 450 pounds maximum weight limit. As a cheap alternative, we recommend this all-weather wicker seat as an excellent addition to your garden, patio, poolside or other outdoor areas. This set comes as 2 separate swing seats which can swing separately, with a maximum weight capacity of 264 pounds per seat. It is also unique in that the swing motion is created by springs. 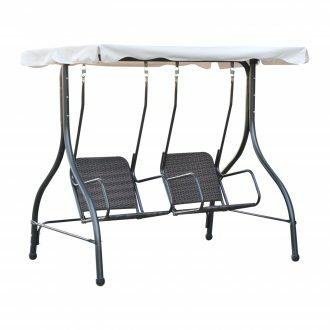 Finally, it features a canopy whose tilt angle can be adjusted allowing you to enjoy the seat outdoors without having to worry about sunburns. 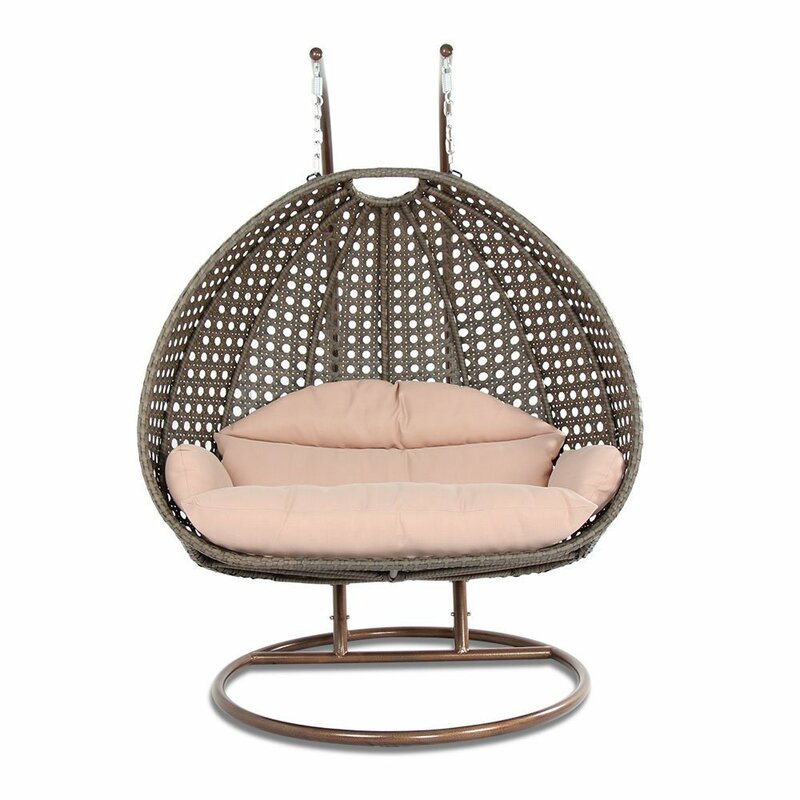 In conclusion, the Island Gale 2 person wicker swing is definitely worth considering. It has a simple yet sturdy and very comfortable design. It is also super easy to set up and take apart at will.